WATCH NO TIME NOTES IN ACTION! If you're spending more than 5 seconds per note, you aren't operating efficiently. If you're uploading less than 3 notes per assignment, you aren't documenting at the frequency of a skilled adjuster. If the appearance of your notes doesn't appear to be written by a highly-paid professional, you will struggle to become one. Are you purposely disregarding events because they would take too long to record in Xactimate? Are you manually writing full notes inside Xactimate? Are you constantly editing Xactimate notes to fit your assignment? How pleased do you think your clients are with the appearance of your notes? Would they support your competency inside a courtroom? No Time Notes CREATES time for you. 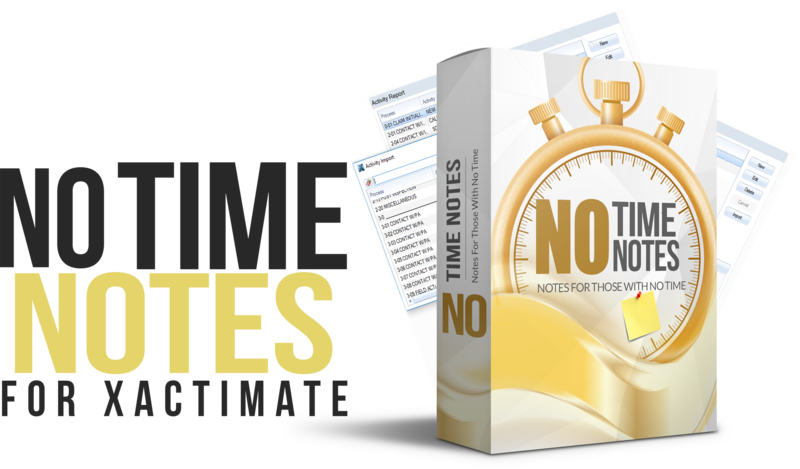 No-Time Notes is a collection of strategically-structured and optimally-organized activity notes to significantly reduce time spent creating notes. It's time to improve the quality of your claims handling with formatted notes that are as detailed as they are aesthetically-pleasing. Invest in notes that your clients will LOVE.